In March of 1917, Tsar Nicholas II was forced to abdicate the throne of Russia. In his place, a conservative Provisional Government formed, representing the official authority of the state. Opposed to the newly formed government stood the Petrograd Soviet, an elected council of workers organized by socialist activists. Over the following months, an internal struggle for power and influence would dominate the country and spark a social revolution. In this state of dual power, or dvoevlastie, charismatic and powerful leaders would rise with the tide of public dissatisfaction and change the course of Russian politics forever. In Dual Powers, each player directs the forces on one side of this struggle through political action, social maneuvering, and military conflict. The player with greater support at the end of the game will shape Russia's future and either launch or suppress the impending Civil War. 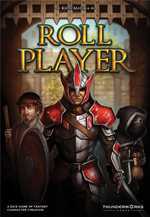 In Roll Player, players compete to create the greatest fantasy adventurer. Roll and draft dice to assemble character attribute scores. Purchase weapons and armor to outfit your hero. Train to gain skills and discover your hero?s traits to prepare them for their journey. Earn Reputation by constructing the perfect character. The player with the highest Reputation wins the game and will surely triumph over whatever nefarious plot lies ahead! 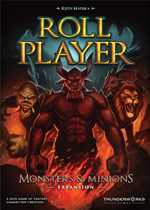 In Roll Player: Monsters & Minions, players compete not only to construct the greatest fantasy characters, but also to gather information about the looming threat and prepare for a final showdown against the beast. The more prepared the adventurers are for the battle, the better they'll fare, but that information doesn't come for free. Listen for rumors to gather details for the fight ahead. Where is the Monster's lair? What obstacles will there be along the way? What will its next strike be? Players earn additional Reputation Stars by driving back the evil Monster and its Minions. The player with the most impressive reputation wins the game and becomes heir to the kingdom!